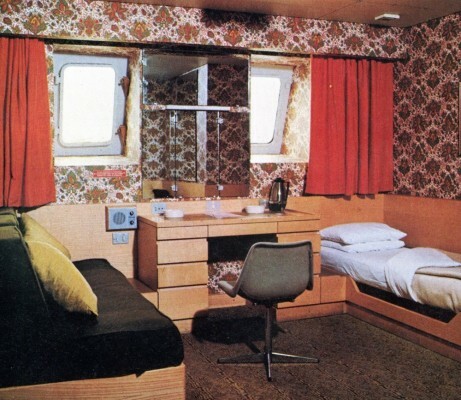 She served for so briefly and it seems so long ago now that (P&O) Southern Ferriesâ€™ Eagle of 1971 has almost been forgotten when reviewing the history of the British ferry. She was, however, a remarkable ship, straddling the ferry/cruise ship divide we take so for granted today that it is almost retrospectively applied to the past. Things were not quite so clear cut back then however and the Eagle, with her all en-suite cabins, meal-inclusive fares and built to US Coast Guard standards with potential future use in mind, followed a similar pattern to her predecessors on sailings to the Iberian peninsular, Klosterâ€™s Sunward (1966, briefly) and the Patricia of Svenska Lloyd (1967 onwards) in offering a mini cruise option which at times almost dominated the car ferry aspects in publicity. More from the introductory brochure. 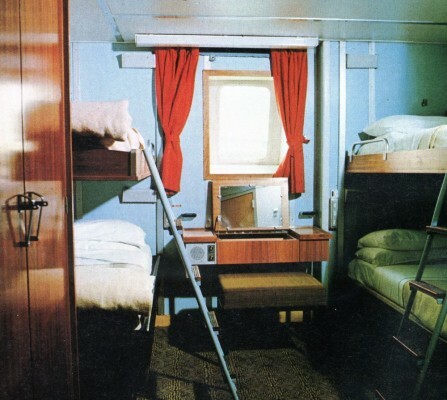 Fares for the 1971 season: the cheapest mini cruise was Â£29 per person between Southampton and Lisbon in one of the C Deck 4 berth cabins; the most expensive Â£75 in one of the B Deck suites. Standard singles and returns were more expensive. Passage was also offerred between Lisbon and Tangier only. 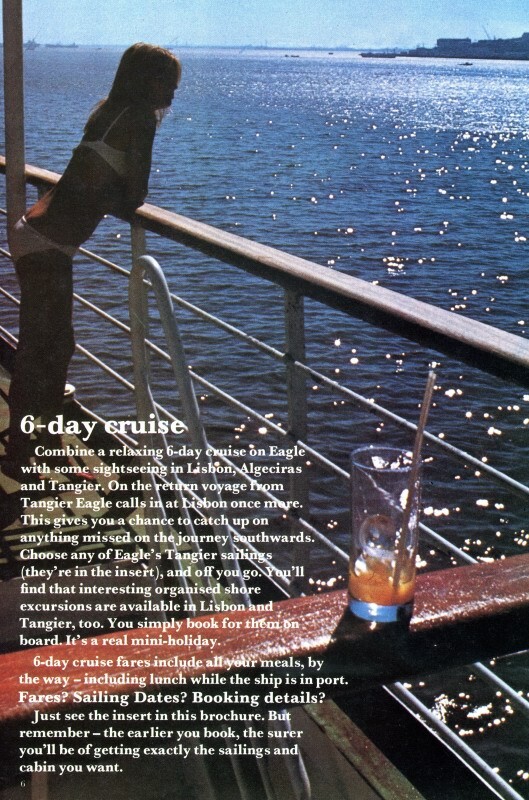 The Eagleâ€™s introductory brochure covers all bases by calling her â€œthe new cruise liner car ferryâ€ and, operating a Southampton-Lisbon-Tangier service, she sailed direct to some of the most fashionable holiday regions of the age. Algeciras in Southern Spain was later added to the schedule. 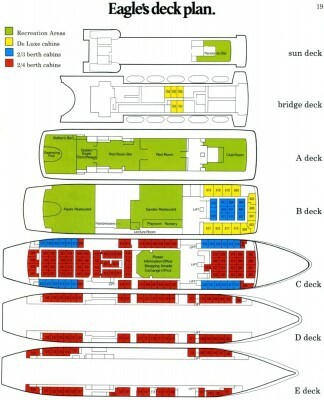 The ship’s hull lines were designed by ferry specialists Knud E Hansen, and supposedly optimised for the Bay of Biscay whilst there was a noticeable bulwark aft of the mooring deck to keep the worst of the waves off the forward superstructure, a feature missing from the Eagle’s two half-sisters, Fred. Olsen’s Bolero and Paquet’s Massalia. 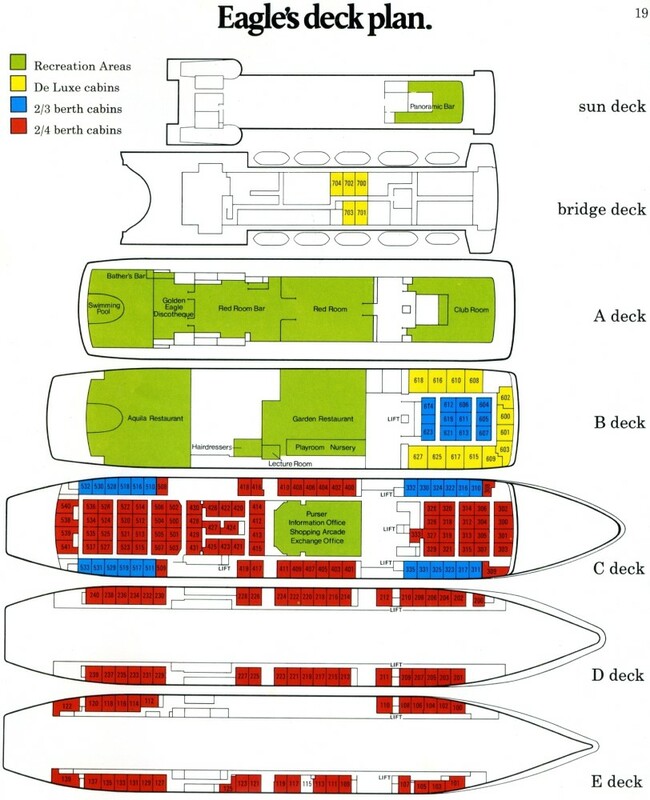 C Deck, above the garage, was essentially a cabin deck with reception and a shopping centre amidships. Moving upwards, on B Deck forward were more cabins whilst, aft of the forward lobby was the first of two restaurants, the more informal Garden Restaurant. 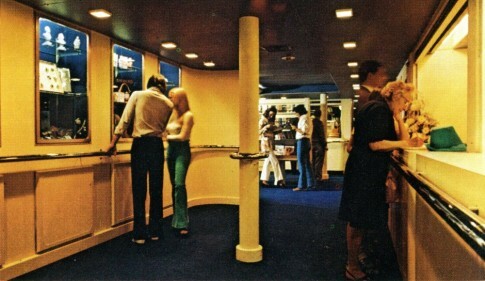 This starboard side arcade connected the forward lobby to the aft Aquila Restaurant; a playroom, nursery and hairdressers could be accessed off the arcade. 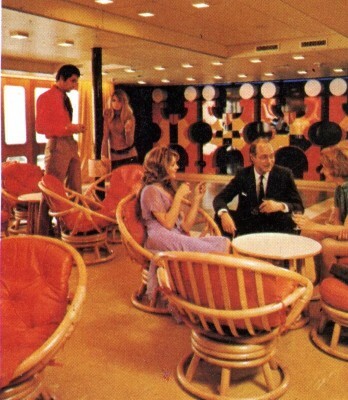 On A Deck, forward was the sombre Club Room. Aft of the A Deck forward lobby was a grand sweep of public rooms beginning with the Red Room lounge and bar. This is the view looking forward in the bar area with the counter on the left. 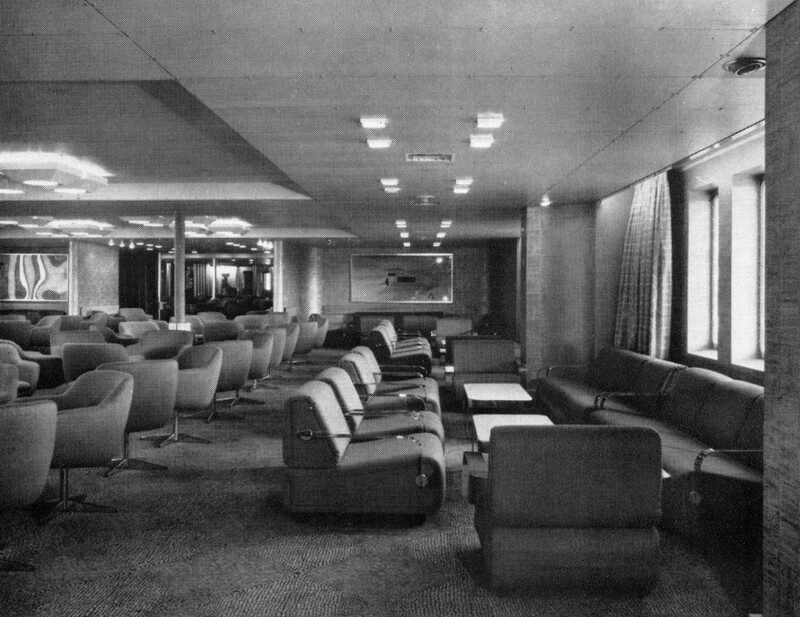 The forward lounge section of the Red Room. The Red Room at night. 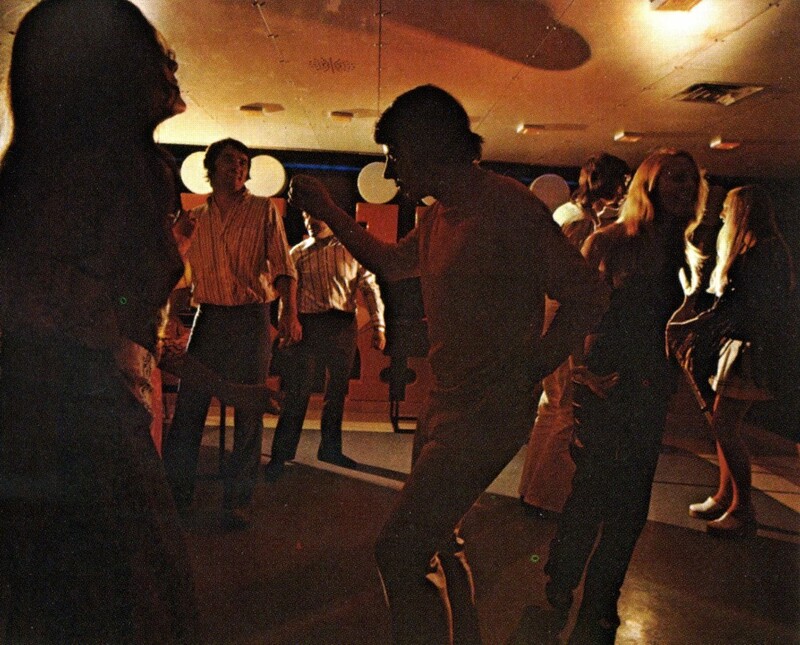 Leading on from the Red Room was what was originally the Golden Eagle Discotheque, provided with stylised glassfibre eagles and bronzed mirrors. 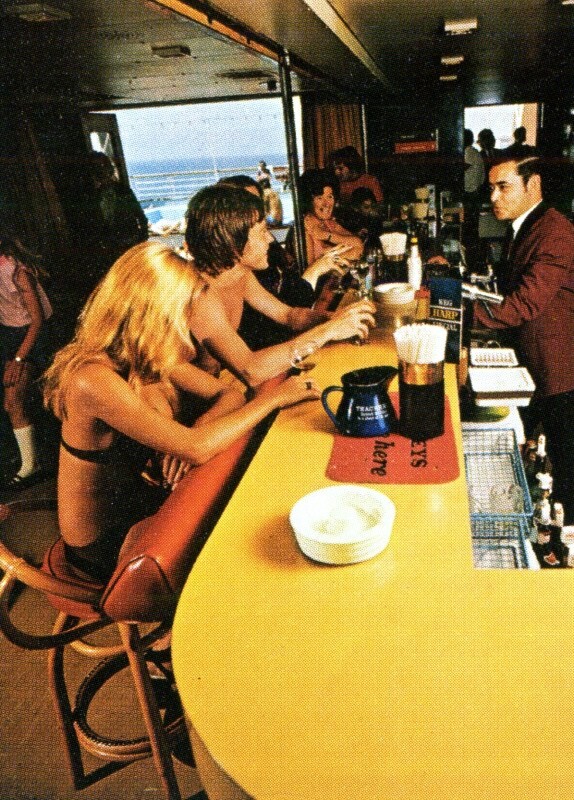 The disco later served as the Lido Bar. The highest public room on board was the Panoramic Bar on the Sun Deck, above the Bridge Deck. 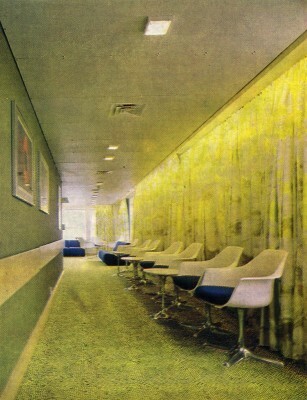 This is the view looking forward in the starboard side entranceway. 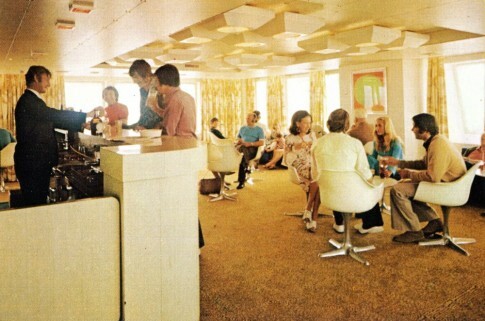 An overall view of the Panoramic Bar. 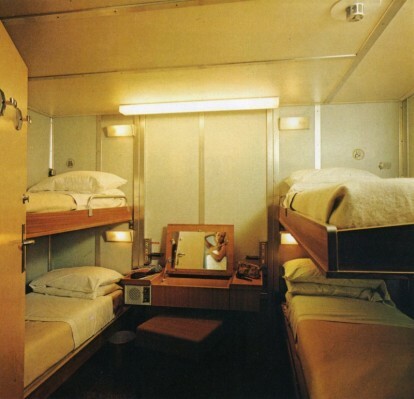 Looking at the cabins, all had en-suite facilities but the most basic were inside with four berths on C Deck. An outside 4-berth cabin, as found on C, D and E Decks. 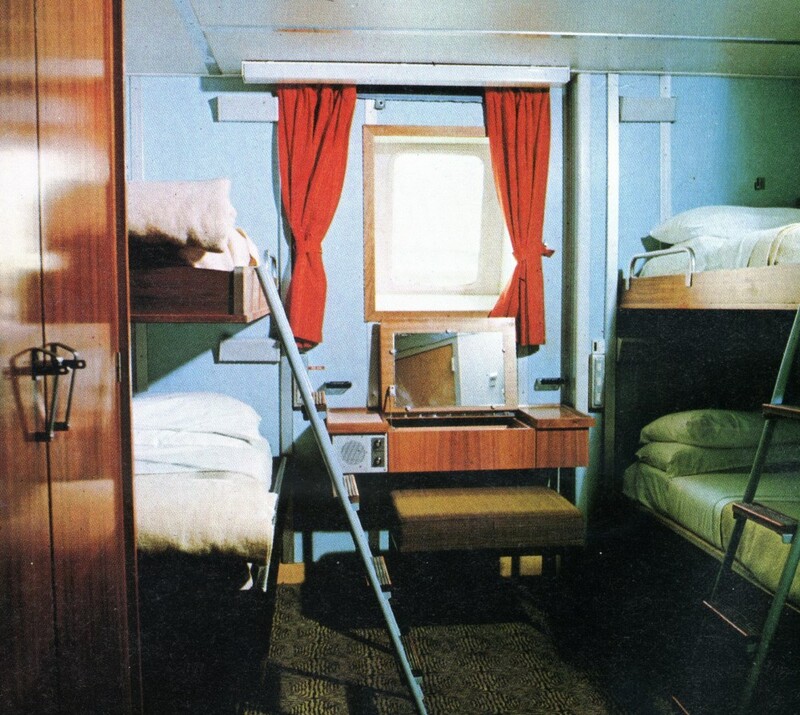 The more expensive cabins were found on B Deck and Bridge Deck, being a combination of suites and De Luxe cabins, the latter as shown here with decor which the 'Shipping World & Shipbuilder' not unreasonably described as 'startling'. The Eagle managed to last just five seasons; the recessionary aftermath of the OPEC oil crisis in 1973 severely undermined traffic and she was sold to the Nouvelle Compagnie de Paquebots, already owners of her half-sister the Massalia, becoming their Azur. 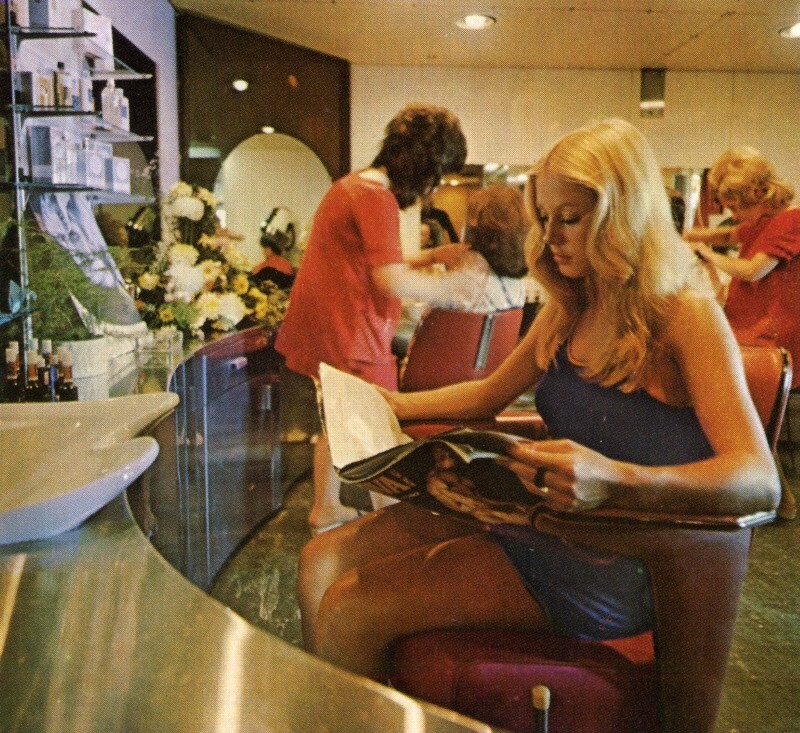 Like the flamboyant Sunward, which had crossed the Atlantic and become the first successful modern Miami cruise ship, securing a place as perhaps one of the Worldâ€™s most influential passenger ships in the second half of the twentieth century, the Azurâ€™s future lay in cruising, and she was permanently converted in 1981 with additional cabin accommodation on her former garage deck. 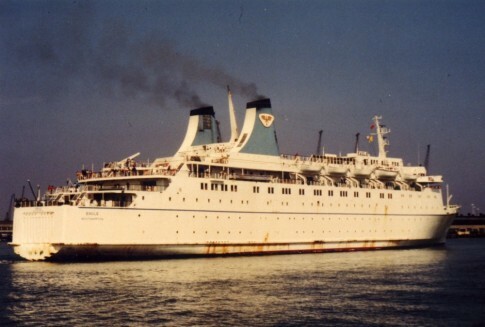 Chartered to Chandris from 1987 to 1994, slightly renamed as â€˜The Azurâ€™, the ship retained this name for the subsequent decade operating for Festival Cruises. Since the latterâ€™sâ€™ demise in 2004 the ship, now the Royal Iris, has remained a familiar sight in mainstream Southern European cruise destinations, catering specifically for the Israeli market of operators Mano Maritime. 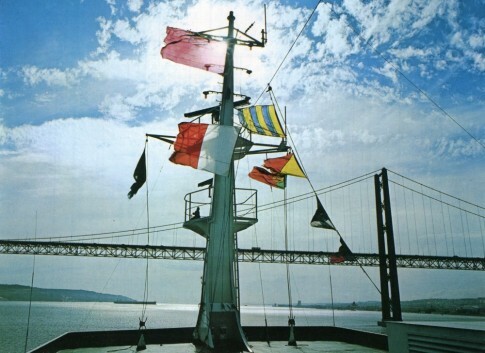 The Eagle passes beneath the Salazar Bridge (later the 25 de Abril Bridge after the Carnation Revolution of 1974) in Lisbon. The ship in her second guise as Paquet's Azur. 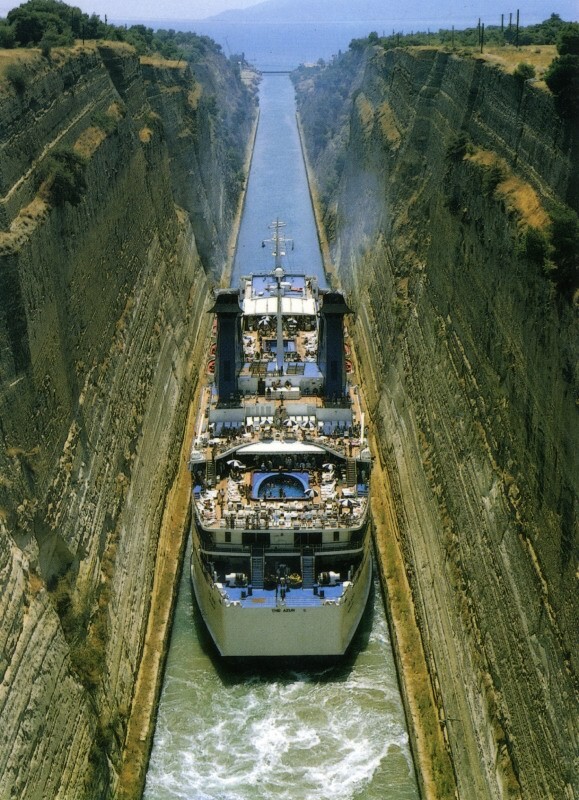 The Azur transits the Corinth canal. The Royal Iris at Heraklion, Summer 2008. Fascinating Blog. I almost went down with the Eagle in Sept 1974, when she was hit by a freak wave in the Bay of Biscay.A tough old tub, she managed to right herself – bulkhead of 1st. class cabins dented in, engine room flooded as water poured down funnel, captain injured when he was thrown across the wheel house – we limped back to Falmouth to dry her out. Interesting page. 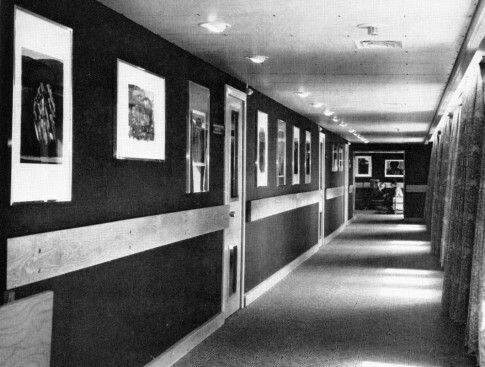 The ‘children’s room’ shows – I think – Jo Ball who was a nanny at this time. I had the privilege to enjoy 20 years marriage with this wonderful lady, before her tragic death, from Melanoma, in Dec. 2005. Can anyone add to or clarify the evidence of the picture, please. 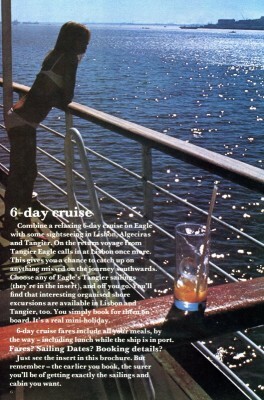 I sailed on a round-trip mini-cruise aboard Eagle in 1973 as a 9-year old. We had sailed the previous year aboard Orsova and I guess Eagle was ‘a little different’. We managed to get the obligotary beat up in the Bay of Biscay in a Force 10 and ended up 12-hours or so late into Lisbon. Bad weather aside it was a great trip and I feel privalaged to have voyaged on such a significant (if largely forgotten) ship. By the way the photos of the playroom and the starboard side corridor are very familiar, another funny incident was my father lighting up his pipe in the cabin and an officer knocking at the door to see if there was a fire, it produced so much smoke. I went on the Eagle twice as a child in 1973 and 1974. It was quite an experience and was the brave new world after holidays with a land ladies in Torquay. I remember the 1970’s chairs very well and it was so modern. We were in a storm just before Christmas 1973 and i rember my brother and i being at the front of the ship just below the bridge when a wave hit the bow. We stood there as the wave which remained green came towards us and knocked us clean over and we ended up rolling about on the floor. I have no idea how high it was but we were thrown about like rag dolls. We got up and ran into ship only for my mother to go mad over the fact that we were in our new clothes for the holiday. She had no idea how close we came to being washed overboard! Its a real shame this route is no longer in operation. I aways thought that the real holiday was the journey to and from Portugal. Great memories. Eagle was indeed the first of her kind, certainly under the British flag. Her failure to keep the run going,apart from the fuel costs, was partly because she was ahead of the times and not enough passengers or freight travelled. Looking at the first post from Sheilah Cardno, she was clearly, and probably just as well, not aware that the wave that caused the damage went over the top of the wheelhouse and smashed in the bridge windows, flooding the bridge and with all equipment except the engine controls out of action. Captain Renshawe was in the way of the flying glass and suffered a bad cut over his left eye. I was the Chief Officer that voyage, and for the next eight hours the passage to Falmouth can only be described as an interesting experience in storm force 10 or worse, though thankfully now astern of us. She was a well built ship and the fact that she is the last of the three sisters to be still working shows it. She was a happy ship, and many of those who sailed on her still meet up and remember those five years. THANK YOU SO VERY MUCH! You can’t! 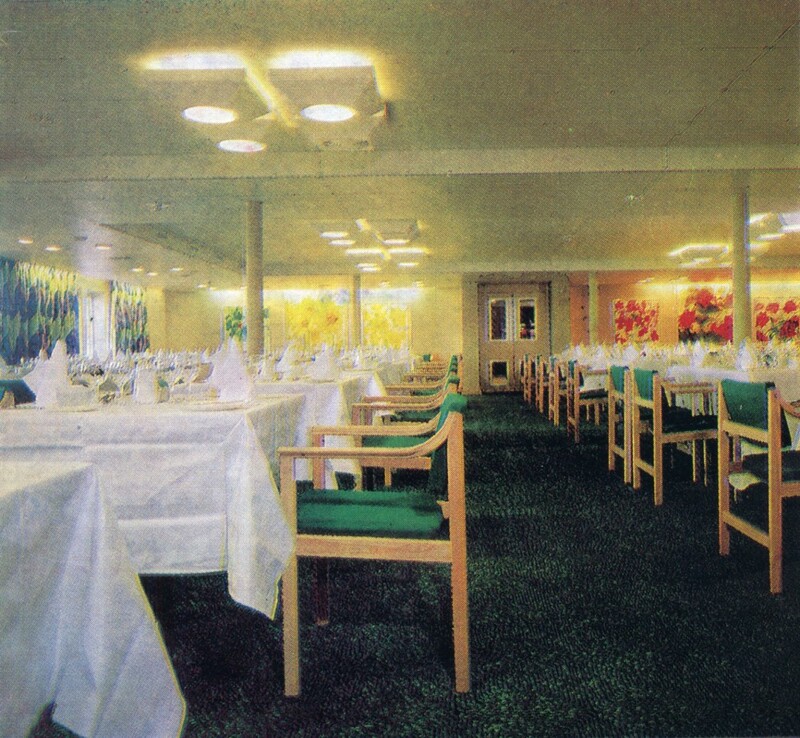 Imagine how grateful I am for the photos of Eagle’s interior. This was the only ship on which I’ve ever traveled. I love ships from the steam liners till cruise ships from the 1970’s. 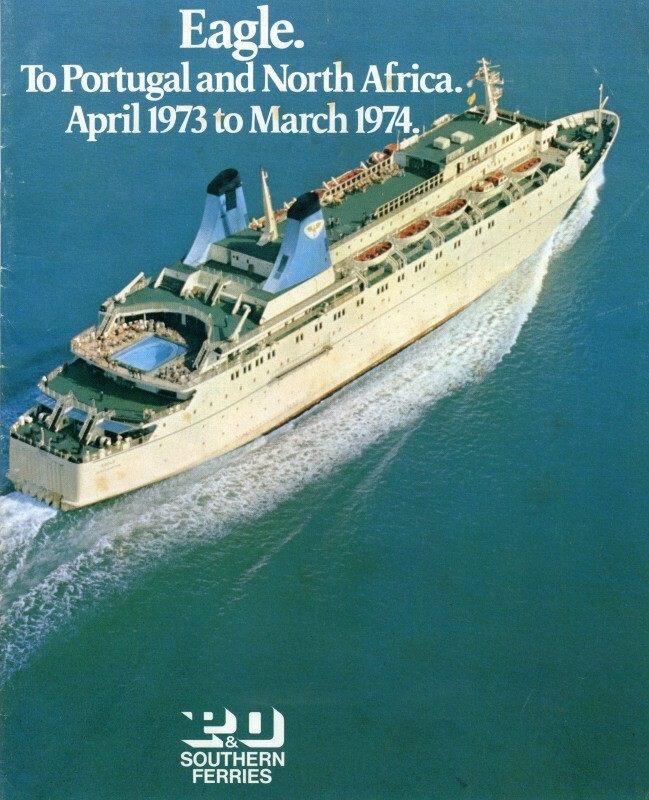 I made the voyage Lisbon – Tangier – Lisbon in 1973, I was a teenager. I’ve only to photos on board because my relative’s camera crashed. Memories are fading from my mind made some of them come back. 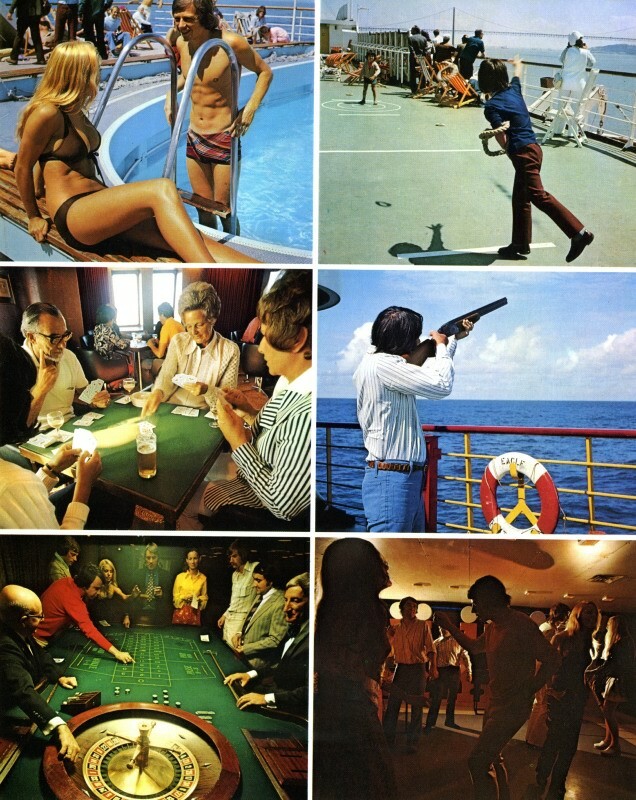 I’m going to copy those photos from the interior (I have form long a photo at sea). And keep them all in my cellphone. I found “Eagle” very beautiful and find her actual painting very kitsch. I’m a member of Belfast Titanic Society and a Titanic enthusiast, along with Eagle. Thank you once again. Forgive some missing letters and words. I’m writing from a cellphone. I have many fond memories of the Eagle. I did the maiden voyage as a stewardess and continued to sail for a further two years. Happy days. Very sad to hear that Captain Renshawe passed away 2011. We used to call him Curly Renshawe. He was a wonderful captain and really enjoyed being with the crew below decks in the Pig & Whistle. Happy memories. 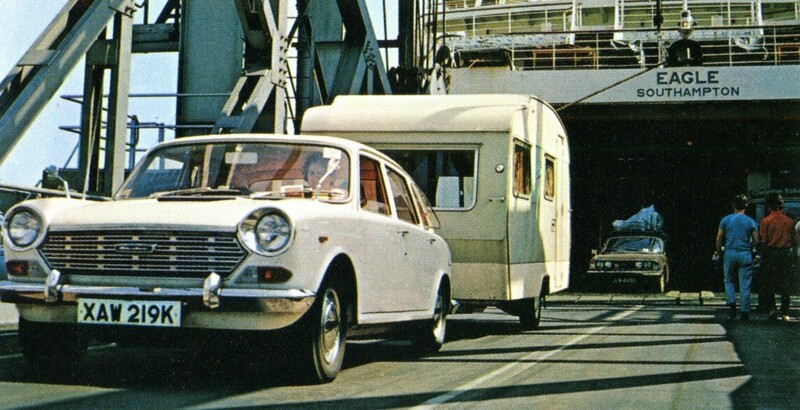 I remember taking a cruise back from Lisbon to Southampton in 1971 with my mother and her Triumph Spitfire. As a 9 year old, I was in love with the sea life and couldn’t wait to return. 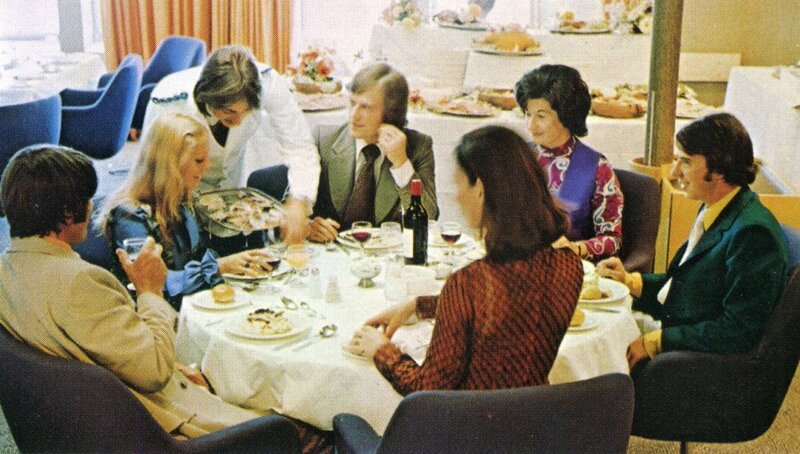 We booked a suite for the Spring of 1973 to go to Tangier and back. I was devastated when the cruise was cancelled due to engine problems. 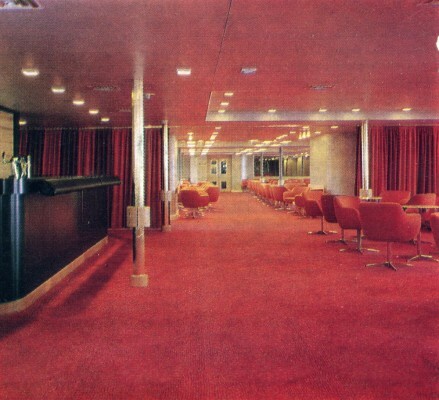 To soften the blow, my father booked us on an 11 day cruise around the Canaries on the Union Castle Reina Del Mar, which was most memorable, although no suite here – an inside berth with no loo! I spent two happy years on ‘Eagle’ as Third Engineer. We worked our socks off to keep her going as her engines were the first of their size and type ond they broke down a lot but we played hard as well. I well remember the week after ‘Eagle’ was damaged as per Barry Peck above – I was told to fill the fore peak ballast tank with sea water and shortly after I started pumping I had a call from a steward whose cabin was near the tank to say that he had just climbed out of his bunk and found himself standing in water! Barry Peck is rather modest as he took command of Eagle for a while aftr Curley Renshaw was injured and steered her on engines alons as the steering gear was out of action. for a while. I should have pointed out that the water was coming from a large crack where the tank joined the hull and that this had obviously been caused by the impact of the wave. I should also have checked my spelling! I was on the Eagle in the spring of 1973. Got caught in a hurricane. Massive amounts of damage and everything tied in the corners of lounge. I fell down the stairs and broke my foot. I still have newspaper cuttings and a few pictures of the damaged vehicles on the quay in Lisbon. 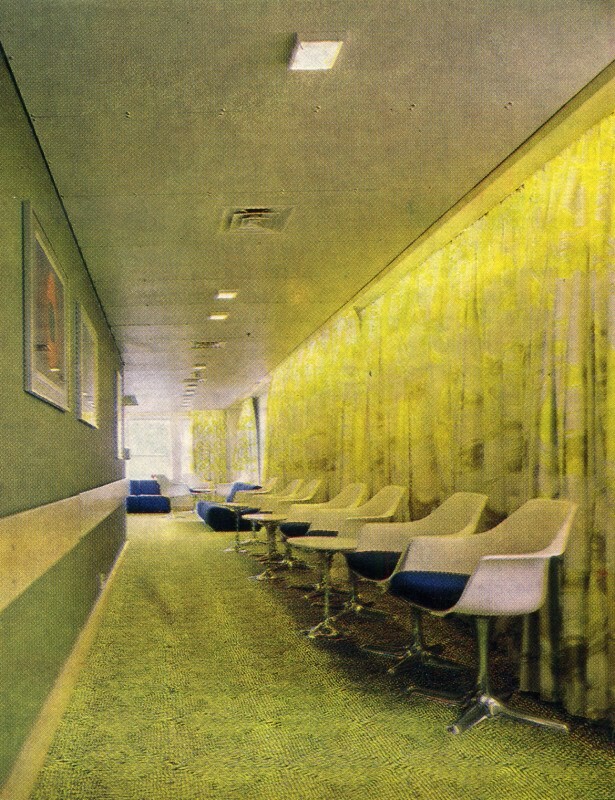 Frozen peas and green paint I remember. Never been so terrified in my whole life. I was 17 and employed as a Nanny to a man and his two children. 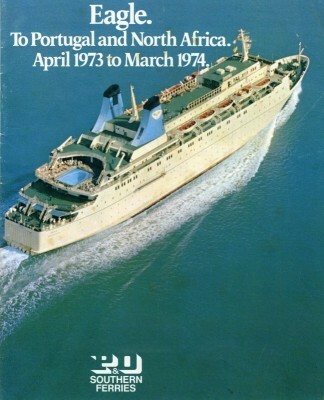 Wow – please I found this site – I was about 9 when we sailed on the Eagle Southampton – Lisbon. I remember it running aground on a sandbank by the Needles, the wind in that Bay of Biscay and I won a hat competition and shook hands with the captain, he gave me a pen with the Eagle’s logo on it. Playing ping pong on deck and running around all over the place, trying to walk in the corridors when the ship was really going up and down ha-ha. I have no idea how I have found this site but I’m so glad that I did – such memories! I was the ship’s plumber from April 72 until June 73 and had many adventures on board Eagle including 36 hrs in a hurricane off Cape Trafalgar when a huge wave came through the forward cabins in the middle of the night and myself and the ship’s carpenter (Albie Ackland) were wandering about in the dark with the ‘old man’ curly Renshaw stuffing mattresses in the port hole openings and attending to burst pipework etc. The next day a wave came down the funnels and stopped the engines and we all thought our number was up as we were ordered to stations and the passengers were assembled on the upper deck with life jackets on – ready to go! There was a rescue at sea that went badly wrong and all the A.B.’s (seamen) were trapped on the other ship unable to return and every spare crew member had to take over watch keeping duties and tying up the ship in Lisbon. Another rescue at sea involved picking up a german national who had his arm cut off in a winch – accident boat launched – helecopter rescue etc. Many nights in the Pig and Whistle and P.O.’s bar – runs ashore to the ‘Texas Bar’ in Lisbon – having a few beers with Kenneth Williams in a Tangiers beach bar! Happy days – happy ship and soo Young!! 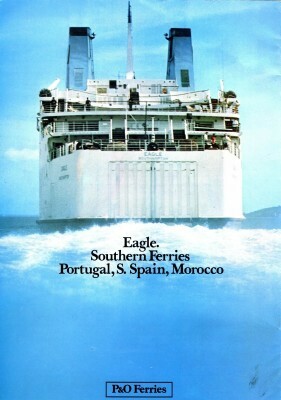 We travelled to Portugal regularly on the Eagle between her second voyage in 1971 and the revolution in April 1974. I was 9 years old the first time I went on the ship and I loved every minute of the adventure. There were a few teething troubles on board, including the time early one morning when a big wave caused the ship to roll and a load of the crockery fell off the shelves in the nearby kitchen. I also remember the engines breaking down and arriving a day late in Lisbon on one journey. 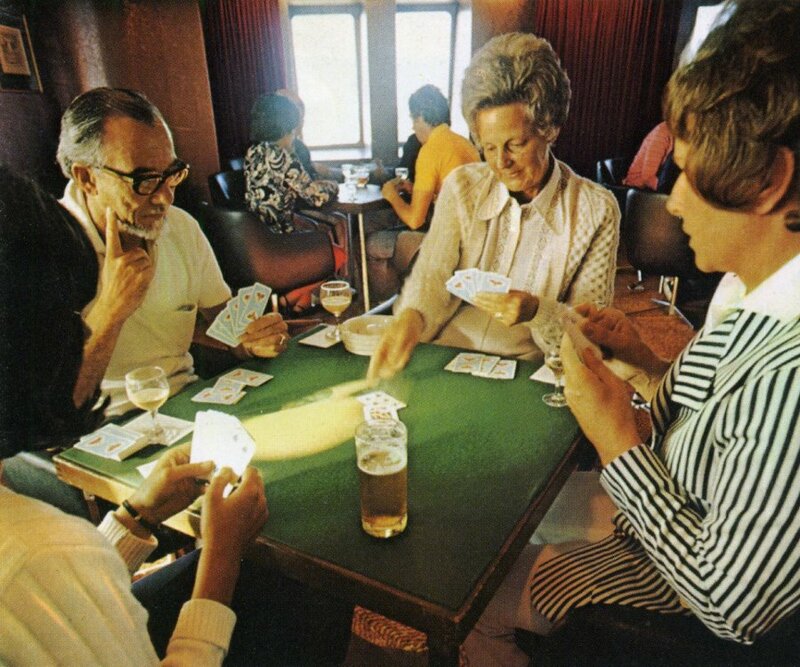 I loved the entertainment on board and remember the ship’s hostesses very well. 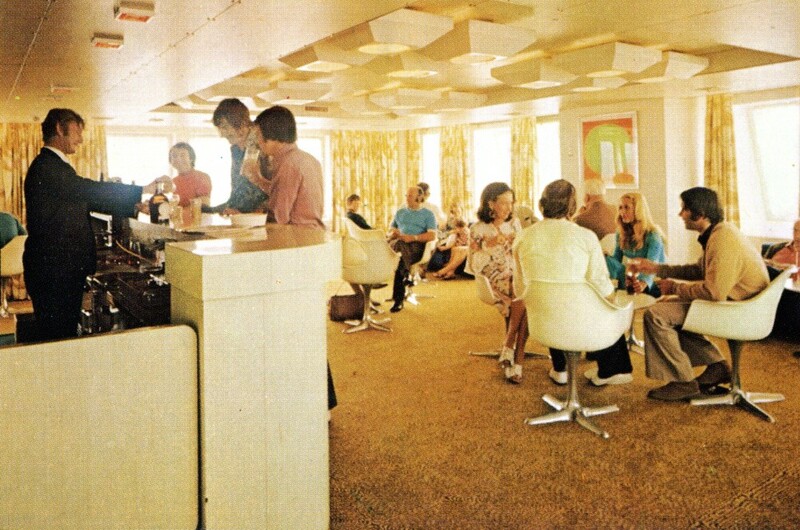 My parents enjoyed the Panoramic Bar at the top of the ship (only open in the daytime) where the barman would mix all sorts of fabulous, colourful cocktails. On one journey in 1973 I was asked to to take part in a publicity photo shoot for the ship with a little girl of similar age on board (I was 12 then). In ‘payment’ I was given a model car (the door fell off) and a certificate from Captain Renshawe which I still have. Sadly I don’t think that the photos were ever used as the ship was taken off the route to Lisbon afte the revolution. 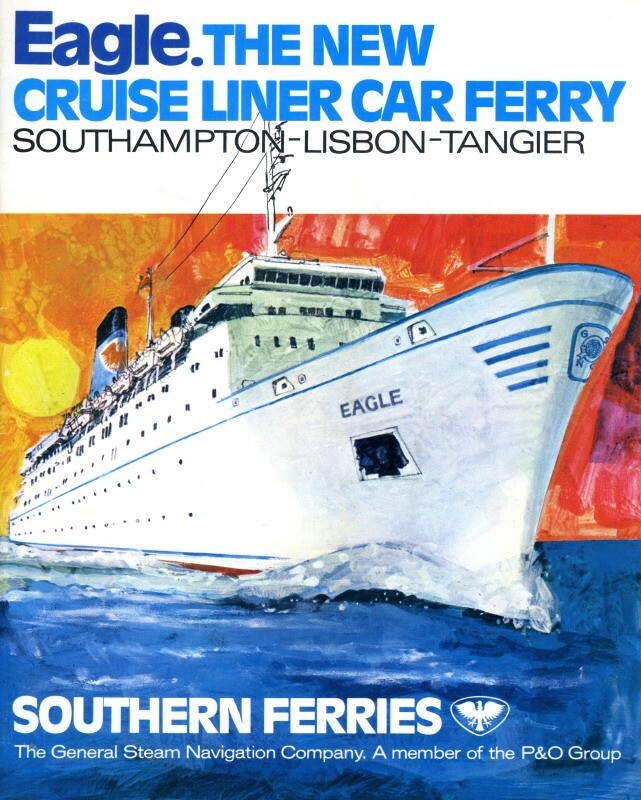 I still have all the brochures for the Eagle (and some for the Azur as she became after she was sold on in 1975) and have very fond memories of our journeys to and from Portugal. Some of the photos above came from the brochures but it is good to see others of the red room, the Panoramic Bar and the corridor that led to the Aquila Restaurant. I used to sit in the windows there watching the sea go by. 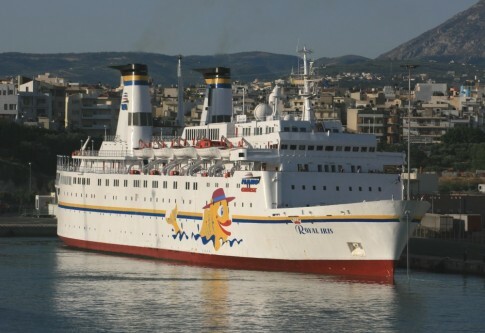 I see that the ship, now renamed the MS Royal Iris, is for sale for 7 million USD. Could this be the end for the MV Eagle after 45 years of service? PS My parents would only dine in the Aquila Restaurant and used to kick up a big fuss if they were allocated a table in the Garden Restaurant. I have a Welsh Woollen blue tweed jacket that I think I bought in the early 1970’s in the shop on board the Eagle, the car ferry from Southampton to Lisbon. It is still in perfect condition and people frequently comment on it. 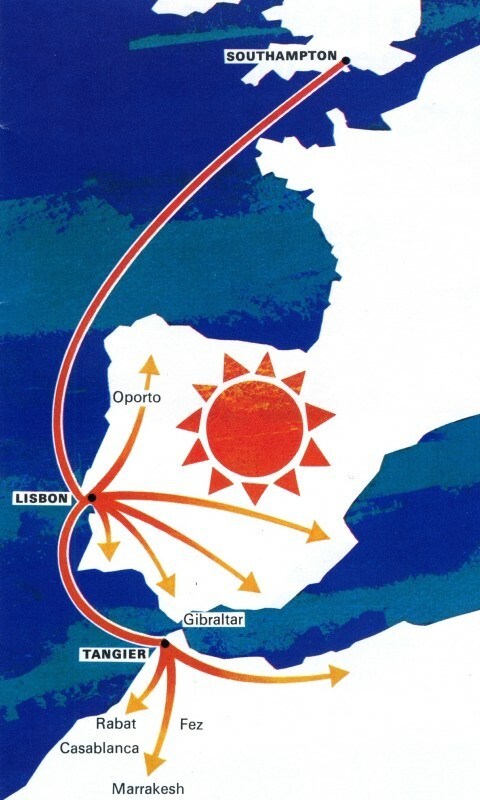 Awful memories of sailing to Lisbon with our parents probably before Christmas 71, storm all night, everyone called for a drill in the morning, many unable to make it. People falling and being sick. One stabiliser gone and at slower speed wallowing in high seas, hideous. Arrived into Lisbon 6 hrs late and were flown home after holiday. Swore I’d never cross the Bay of Biscay again. I joined the Eagle as a steward, coming off the S.S.Canberra, 45.000 tons to 11.500 tons, everything seemed smaller apart from the waves. 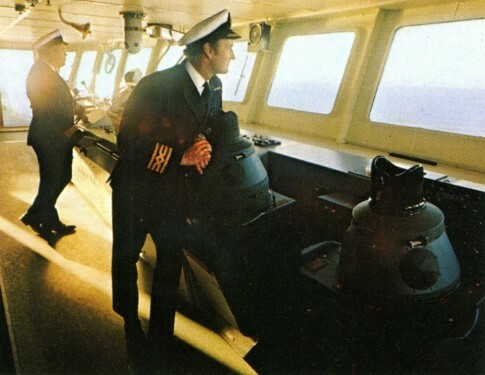 I too fondly remember Captain Renshaw and the night the bridge got clattered.To the rear of the Aquila Restaurant were I worked, port and starboard were french doors onto an outside deck,out of bounds to passengers in heavy weather but not to me. Looking up at torrents of airborne spray passing high over the funnels, having broken from the bow, and landing in the sea behind us then looking over from the back rail, where for a moment you could almost touch the sea but then you rose and rose until you could see a propeller turning slowly in thin air. It was a breathtaking experience. I was amazed to read that she was for sale as late as 2016 but then she was a brave little ship. I was a photographer on this ship for a few trips. I remember the storm of 1974 well. One voyage a crane broke loose in the car deck and smashed up some cars, force 8 I believe. Next was the worst storm I’ve ever been in, possibly off the chart. All the windows on the bridge taken out along with the first class cabin windows below. The captain had to borrow my display screens to fill the gaps where the bridge windows had been. Several of us were asked to keep the passengers entertained while we diverted to Falmouth. We weren’t making any headway and would probably have gone under if not for Captain Renshaw. Remarkable seamanship to turn us around. I left the ship after that voyage. I was the master who took EAGLE to Marseille wherewas name AZUR in1975.She carried this name untilAug 2008.She was aquired by Mano Marine of Panama.She seems to cruised fromHaifa for the next few yearsaround the Eastern Med.At some time she was laid up in greek portCHALKIS, and I feared the worst.It appears that in Jan 2017 her owner appears to be Russian Federation and renamed KNYAZ VLADIMIRand appeared to have runSOCHI toSEVASTOPOL.A 350 miles trip.My latest info says she is laid up in the later port since Sept 2017.It is niceto think that since entering service on18th May 1971 she is still afloat after 52 years later.I was only 32 at the time. http://www.faktaomfartyg. se .I belive itis Swedish. To all my old ship mates I send my best wishes, they were happy days. What a fascinating site! 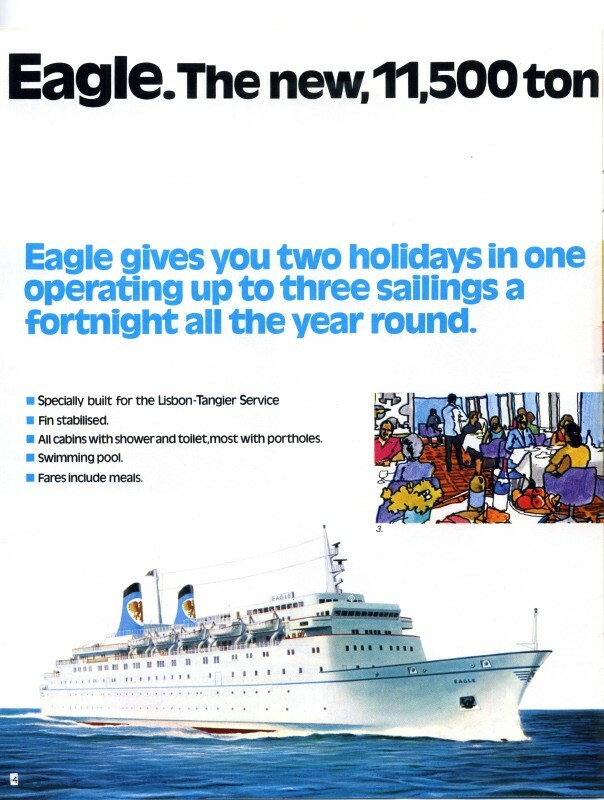 We lived in Portugal in the early 70s and in the summer of ’74 went back to the UK on holiday, sailing on the good ship Eagle. I don’t think we had any bad weather on the trip but I certainly do remember the stories of what happened on other trips. Amazingly, it appears that the Eagle is still in business, now called Knyaz Vladimir (Prince Vladimir) and is playing a part in Mr Putin’s politics for the Black Sea area. 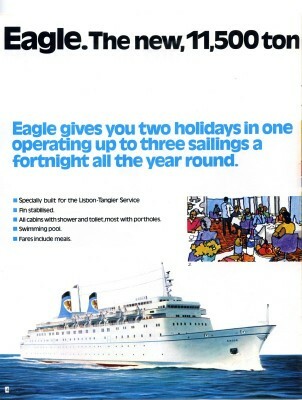 I have very happy memories of travelling on the Eagle with my parents and Nan as a 3 or 4 year old, around 1973. 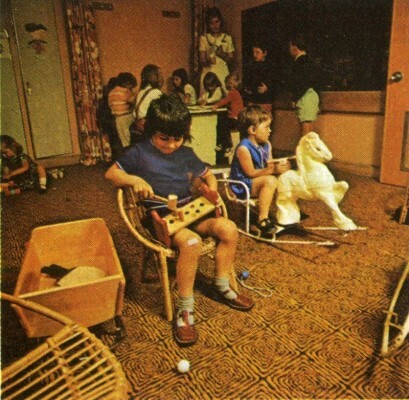 I remember on one occasion my nan insisted I go on the rocking horse in the play room, against my wishes, and I was subsequently violently sick all over her new dress! Despite this, I can remember lovely family times around the pool and other areas. Seeing some of the photos makes me feel quite nostalgic. Very pleased to have found this site and read all the interesting stories! When I was age 10 my family moved to Portugal to farm in the Altentejo. Quite an experience in those days! We travelled to Lisbon on the Eagle, along with all our possessions including tractors & farm equipment, plus our family pets, two dogs and two horses (well one horse Lady, and our pony Billy). 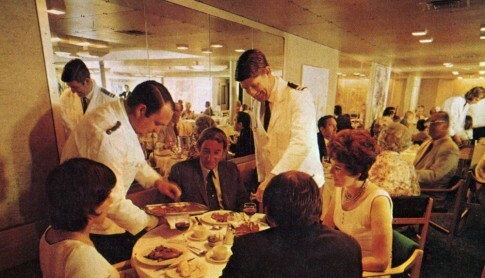 It was the beginning of a fantastic adventure and I have very fond memories of the Eagle, including the wonderful food & dining experience in the two restaurants. 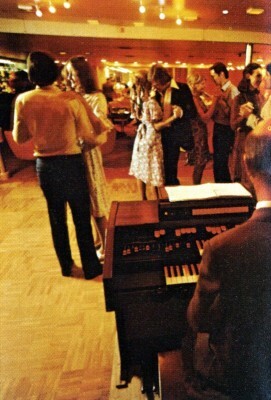 I remember waltzing on the dance floor with my lovely Dad, who has sadly passed away since. Happy times! 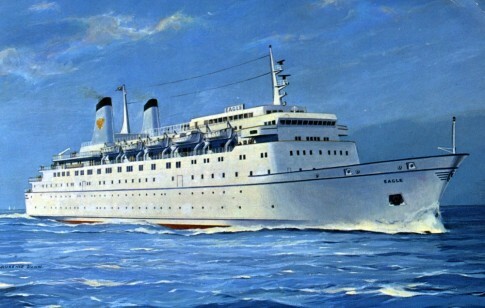 Just had a natter with an old P&O pal of mine who was the last Captain of Oriana on her handover trip to the Japanese. We were both on Oriana during the seventies and he was wondering when the Eagle big wave occurred because Oriana hove to. 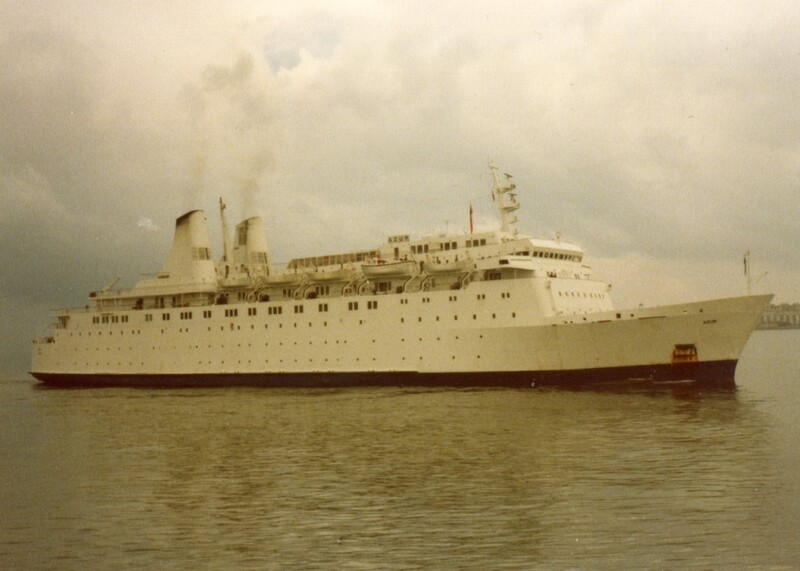 So I googled and found this website very interesting, I was on secondment from Passenger Division for the whole of August 1975 as RO with Dave Atkinson. I traveled from Lisbon to Southampton in January, 1972 through 40 foot waves in the Bay of Biscaye- ‘Graveyard of the Atlantic’. The ship had been in dry dock at S’hampton for 3 months and this was to be the last sailing of the season. As it turned out, it seemed it would be its last sailing EVER! One of the more hair-raising events of my entire life! And would not have missed it for the world! Would anyone like a 1970s brochure and Welcome Aboard information leaflet for the Eagle Southampton-Lisbon-Tangier? 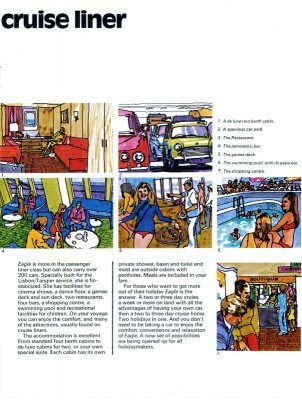 A lot of the images from the brochure are on this blog, but the real versions are very interesting. now 47 years old, a tribute to french ship construction. bussle of ship movements , there seems to be no haste in the Western Docks development . I love your testimonies on board the MS Eagle. Do they have photos to send me? in particular from Lisbon? Thank you, for your attention. I love your testimonies aboard the Eagle. Haha! Reading through the comment I left at silly o clock this morning I see I said it was 1971 or 2 when I should have said February 1973. Also predictive text has changed croupier into groupies which makes for strange reading! Now Im actually awake and looking at everything again I’m surprised there isn’t a photo of the casino – but it was great to see the other pictures especially as a few years ago our house was flooded and I lost a lot of very old photos forever. Does anyone remember Capt Ian Leggatt – he was master on my only Eagle trip when as a young teenager I teamed up with some other pax and we got second prize in the fancy dress …possibly as there were only a couple of teams who could remain upright in the ‘Bay. It was the trip before the crane incident and a bit bumpy. I am just digitising our family photos and have some of Eagle which is how I came to this site. I’d be happy to share them if I can have a link. A happy ship – perhaps marketed ahead of her time. Glad she is still in service. My brother, P.E. Webb was purser on Eagle. I remember a wonderful cruise on her with my parents back in the early 70s. I have a photo shaking hands with you, Robbie! Happy days!